Known as Lapsang souchong , this nice smokey flavor tea with touch of the nuts gives very pleasant mouth feel. This is not a high class of the Lapsangs but it gives decent tea liquor for many steepings. Very good daily drinker for those who like LPS. Add to cart to see reward points for this product. 270 .. . 270 . . CNY 13.50. 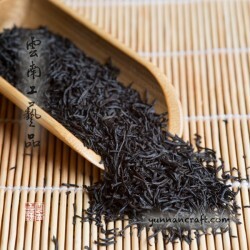 Lapsang souchong is the ancestor of Chinese black tea that first appeared in the late Ming dynasty. Originally it’s from Mountain Wuyi of Fujian Province. Mountain Wuyi is one of the famous tea mountains in China and it's located in northwest of Fujian Province.